"Starting At:" price indicates there may be multiple fabrics available for this upholstery item and price may vary based on fabric chosen. Contact Store to confirm availability, pricing or learn about additional fabric options. A vast improvement over those expensive and crowded multiplexes, your home theater room can be a comfortable and private place to enjoy your favorite films right at home. 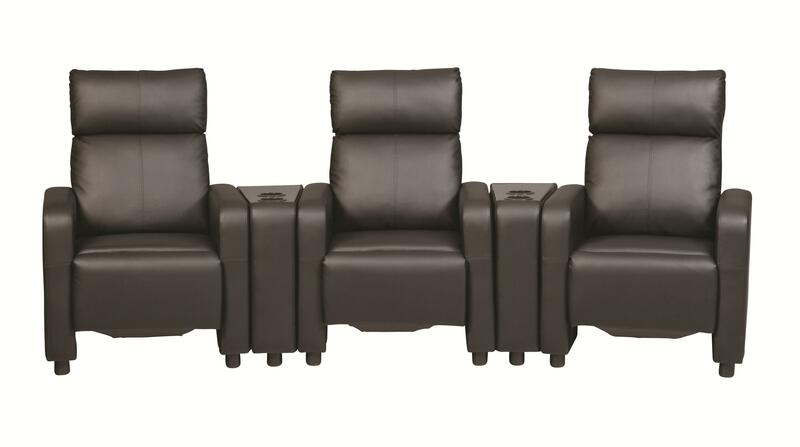 This exceptional home theater set features three seats with tall backs and hi-leg recline mechanisms. A sleek, contemporary look is the perfect match for your high tech media set-up. Features two wooden console tables, each with two built-in cupholders. Upholstered in black, leather-like vinyl. The Toohey Contemporary Five Piece Reclining Home Theater Seating with Console Tables by Coaster from Nashco Furniture - Nashville. We proudly serve the Nashville, Franklin, Brentwood, Clarksville, Green Hills, Davidson County, Williamson County, Tennessee area. Product availability may vary. Contact us for the most current availability on this product. 600181 Push Back Recliner 3 28.75" 32.5" 41.75"
600182 Console 2 28.75" 9.5" 25"